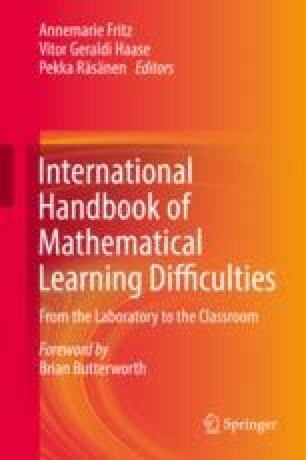 The first scientific reports of mathematical learning disabilities or dyscalculia indicated that these impairments originated from abnormalities in brain structures or functions related to mathematical processing. Due to the increasing availability of non-invasive brain imaging methods in the last decades, such as magnetic resonance imaging or MRI, there has been an increase in our knowledge about the brain networks that are relevant for mathematical performance. This research was originally limited to adult participants, but there is now a nascent body of developmental imaging studies in children as well. Research in typically developing children indicates that a frontoparietal network is consistently active during number processing and arithmetic. This network shows both communalities and differences with what is being observed in adults. Children with dyscalculia show functional as well as structural abnormalities in this network. In the absence of longitudinal data, it is currently unclear whether these abnormalities are a cause or consequence of this learning disorder. Future studies are needed to investigate this. This paper has some text in common with De Smedt and Ghesquière (2016) and Peters and De Smedt (2018).